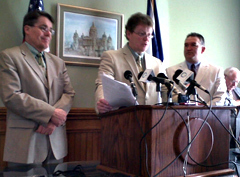 Democrat leaders Mike Gronstal, Patrick Murphy, Kevin McCarthy (l-r). After meeting for a total of 79 days over three months, the Iowa House and Senate today concluded the 2010 legislative session. House Speaker Pat Murphy, a Democrat from Dubuque, spoke just before the House wrapped up its work at 12:22 this afternoon. “When we came here in January is was nice and cold,” Murphy said. “I can’t think of a better time to adjourn than over the noon hour when it’s 72 degrees outside.” The Iowa Senate concluded its work about 25 minutes later. Democrats hold a majority of seats in the legislature. It means Democrats control the legislature’s debate agenda and Democratic leaders use words like “success” to describe the work of the General Assembly while Republicans are critical, primarily of the spending plan Democrats developed. Gronstal says Democrats, in general, put together a balanced state budget, without raising taxes. “I think that’s very responsible budgeting,” Gronstal says. Gronstal says it’s now up to legislators from both parties will take these arguments to the campaign trail and see how well they sell with voters.